Glen and Star Allen began their grand Whizzer adventure. 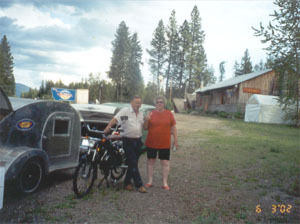 Mr. Allen is planning to ride his 1999 Black Classic Whizzer from Yakima, Washington to Sault Ste. Marie, Michigan. The length between these two cities is over 2,000 miles. Mr. Allen's wife, Star, will be following him with all of the things that will hopefully keep Mr. Allen (and his Whizzer) running. Their plan is to take Route 2 all the way into Michigan. They have a Family Reunion to attend in Sault Ste. Marie the first week of July. 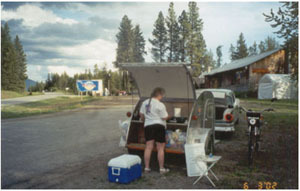 The sign that is on the back of their camper...made by Judi Wibberding. The Allen's extend their sincere thanks for all of Judi's help. Mr. Allen has ridden his Whizzer 261 miles over the last two days. 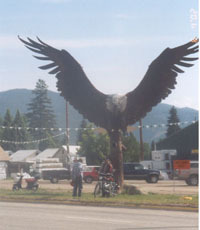 He made it to Rathdrum, Idaho yesterday. They are traveling mostly early mornings and early evenings while it's cooler. The temperature has been in the 80's during the days and 50's at night. His wife, Star, closed her business for two months just so she could make this trip with him. 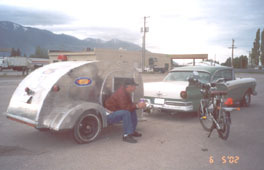 She is following him in a 1957 Ford auto and pulling a tier drop camper. The Allen's would like to extend special thanks to their nephew John, Coy Farmer and Mark at Valley Cycle in Yakima who all helped prepare everything for their trip. The Allen's are hoping to make it to San Point, Idaho today. 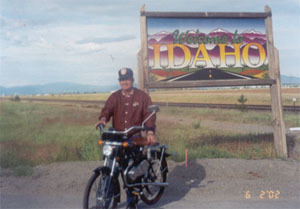 Mr. Allen rode his Whizzer 98 miles yesterday and reached the Idaho/Montana border. 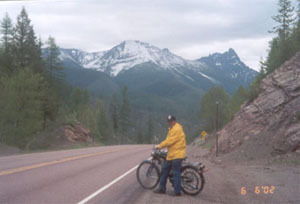 He's ridden it 30 miles so far this morning and is now in Libby, Montana. He said this morning it's a little chilly but the countryside is beautiful. Their friends Coy and Mavis Farmer caught up with them last night and are riding along with them on a scooter. They're taking a lot of pictures but haven't found a place to develop them yet. 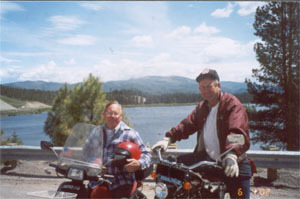 Mr. Allen wanted his brother to know that he got up over the hill at Bonners Ferry just fine. The Allen's are planning to make it to Kalispell, Montana today. Mr. Allen rode his Whizzer a whopping 153 miles yesterday. So far he has ridden 512 miles (a quarter of their trip.) They made it to Columbia Falls, Montana yesterday which is quite a bit further than their original plan. Their friends, the Farmers, have loaded their scooter up and are heading back home. It's raining today and he is riding through the Rocky Mountains...if they make it to Browning, Montana, he'll consider it a Big Day. Mr. Allen rode his Whizzer 34 miles yesterday and has ridden 106 miles so far today. They made it through the Rocky Mountains today, crossing the divide, and even over a 5,000 ft. high mountain. They are currently in Cutbank, Montana. They are now 652 miles into their trip and are hoping for a total of 200 miles today. Mr. and Mrs. Allen wanted to thank their friends, the Farmers, for riding along with them a couple of days ago and they wanted to say hello to the staff and crew at Waconi where Mr. Allen works part time. Mr. Allen rode his Whizzer 240 miles yesterday. Wow...what a day! It was raining hard and they had heavy winds blowing with them so they took advantage of it. His support crew is sleeping in a little today and since they're ahead of schedule, they will probably take it easy today. They are currently in Havre, Montana and 786 miles into their trip (over a third of the way to their destination.) In speaking with Mrs. Allen this morning, she is holding out well. She often gets ahead of Mr. Allen and catches up on some reading, crocheting or plays pocket Yahtzee. The Allen's would also like to thank Dave at Buster's Bicycle Shop for his help before their trip on the technical end. Mr. Allen rode his Whizzer 150 miles over the weekend. They are currently in Williston, North Dakota and their next stop should be Minot, North Dakota. There are terrible storms in North Dakota today so they're waiting it out at the Checker store in Williston. They are now 936 miles into their trip. We heard from their family in Sault Ste. Marie today who conveyed that they're truly looking forward to having them there for the reunion. Mr. Allen rode his Whizzer 40 more miles and they are now 976 miles into their trip. They are currently in Towner, North Dakota. It is very cool and windy there and they're hoping to travel 125 miles today. The Allen's would like to thank Allen Edwardson and Tami Kulzer for opening up their house to them and allowing them to use their shop to make minor repairs to their '57 Ford. Mr. Allen rode his Whizzer 130 miles yesterday and they are now 1,106 miles into their trip. The are currently in Devils Lake, North Dakota. It is very rainy and cool there now. Since they're so far ahead of schedule, they plan on loafing around a bit today but still want to make it into Minnesota. They said they are receiving a lot of inquiries and admiration regarding their bike and car from the many people they are meeting along the way. They wanted to say hello to their daughters, Carrie and Chayne, as well as their grandchildren, Blake, Bryce and Levi, and let them know that they're having a great time and doing well. Mr. Allen rode his Whizzer 90 miles yesterday and they are now in East Grand Forks, Minnesota. They've now traveled 1,196 miles. It was rainy and miserable yesterday so they had to pull off to a rest area for a while and wait for the heavy storms to pass. The windshield wipers on their car weren't working yesterday but Mrs. Allen toughed it out. What a trooper she has been to assist Mr. Allen in fulfilling one of his dreams! Today it is 75-80 degrees, clear and beautiful. They plan on kicking back a bit today. Mr. Allen wanted to let his sister know that he's sorry they missed her 45th wedding anniversary. They also wanted to thank Jo Jo at Tieton Trading Post for his help before they left on their trip. Mr. Allen rode his Whizzer 85 miles over the weekend. They decided to have a little bit of fun this weekend. They arrived in Fosston, Minnesota on Friday night and went out for tacos and stew and enjoyed a Norwegian band. On Saturday, after finishing their laundry chores, they attended the First Annual Backwoods Pete Festival. On Sunday, they headed down to Itasca State Park and are now at the head waters of the Mississippi River. Itasca is 40 miles out of their path so that should add a few extra miles onto their trip. Star said that Glen has been walking a little bit funny in the evenings-we can't imagine why :) . Mr. Allen rode his Whizzer 102 miles yesterday and 38 miles so far today. They are currently in Floodwood, Minnesota. They are now 1,421 miles into their trip. Early yesterday morning they toured Itasca State Park before venturing forward. The wind has been against them yesterday and today. Mr. Allen said that the army worms are migrating in Minnesota now and they're all over the road which is making the ride a little bumpy. They hope to reach Duluth, Minnesota today which is at the Minnesota/Wisconsin border. We have been receiving a lot of messages of support from their family and friends and conveying them onto the Allen's. Everyone is so proud of their efforts. The Allen's arrived in Saginaw, Minnesota last night. This morning, they toured Duluth, Minnesota to figure out the best way to get through the city without hitting the major freeway. It is terribly rainy and drury today and they still haven't found a replacement windshield for their Ford. They will probably hang out at the park in Saginaw today although Mr. Allen is ready to move on. Also, in calculating the miles on an atlas today, we think he may have ridden a couple hundred miles further than what we've recorded. We'll find out for sure when we talk to him tomorrow. The Allen's rested in Saginaw, Minnesota last night due to heavy lightening and rain. This morning they're on the move again since it's quite a nice day. They're almost in Duluth and Mrs. Allen is going to drive the car/camper on the freeways while Mr. Allen worms around through town and across the bridges. They are meeting in a parking lot at a grocery store in Superior, Wisconsin once they both get through Duluth. They have decided to head south on a new adventure since they're so far ahead of schedule. Mr. Allen worked as a crane operator from 1965 until last fall and is currently a crane instructor part-time. He wants to tour the Manitowoc Engineering crane plant in Manitowoc, Wisconsin on Monday. We are currently trying to reach the plant to set up an appointment for them. Mrs. Allen called again this afternoon and mentioned that instead of army worms, they are now having to deal with masses of horseflies everywhere. They have actually traveled 1,813 miles since they began their adventure. Mr. Allen rode his Whizzer 121 miles yesterday and they spent the night in Mellen, Wisconsin. He has ridden 98 miles so far today. The Manitowoc Engineering crane plant has refused to give the Allen's a tour of the facility citing that they do not have the staff to handle individual tours. It started raining about an hour ago and it's about 60 degrees. They are now in Medford, Wisconsin and they will now start heading northeast again since they can't tour the plant. Mr. Allen's quote of the day: Anybody can ride a Harley across the country, it takes a special person to do it on a Whizzer. The Allen's would like to thank their friend Sandy for all of her help before they left on their adventure and wanted to let their family and friends know that they're thinking of them. Mr. Allen rode his Whizzer 168 miles over the weekend. They arrived in Merrill, Wisconsin on Friday evening. It was raining like crazy that night and he said it was the most fun he's ever had riding his Whizzer. On Saturday, they arrived in Pembine, Wisconsin. A Wisconsin trooper stopped him on Saturday because his Whizzer didn't have a license tag. He shared with the trooper that Washington state doesn't require it to be licensed and the trooper told him to have a nice trip. On Sunday, they crossed the border and they're now in Iron Mountain, Michigan. There were lots of deer everywhere over the weekend. They saw some wild turkeys and he stopped to help a snapping turtle get off the road. The turtle tried to take a bite out of his front tire and then scurried off the road. Also, back in Idaho, Mr. Allen put another turtle back into a creek. The Allen's wanted to say hi to all of their folks and they're looking forward to seeing ALL of them at the reunion. The Allen's are seriously considering doing the adventure again on the way home if their schedules allow for it. Mr. Allen rode his Whizzer about 50 miles yesterday. They are currently in Escanaba, Michigan. Since they're so far ahead of schedule, they have been doing quite a bit of loafing and taking in the scenery. They want to make it to St. Ignace, Michigan by the weekend to attend a car show event. His brother left from Washington in a pickup yesterday heading toward the reunion. They plan to meet each other before they get there. Mr. Allen told his brother to check all of the Walmart parking lots on the way and he'll probably find them in one. Mr. Allen rode his Whizzer 57 miles yesterday and they landed in Manistique, Michigan last night. There was a severe thunderstorm with hail last night so they were stuck in their camper for quite a while. They're having to fight lots of mosquitoes as well. They took a side trip this morning to see the Big Spring in Thompson, Michigan. It's near Indian Lake and is two miles deep. The Allen's are about 144 miles away from their destination. Mr. Allen rode his Whizzer about 30 miles yesterday and they are now at the end of the Mackinaw Bridge. It's 80 degrees with a breeze and gorgeous. Mrs. Allen said today that they're having a ball. Mr. Allen's quote today: God should have created me with wheels on my heinie. They will be attending the Antique Car Show in St. Ignace this weekend which is supposed to be the second largest in the country. We asked Mrs. Allen if she was up to doing the same adventure on the way home and she said that as long as she gets home by the end of July, she's truly game. The Allen's are enjoying the car show today and will probably stay there for the weekend. He said the engines roared until about 2:00 a.m. last night so they didn't getting a whole lot of sleep. Mr. Allen's brother found them today. He has spoken to the bridge authority and they probably won't let him cross the Mackinaw Bridge on the Whizzer but they said they'd haul it across for him. They have traveled about 2,550 miles since they began. The Allen's have made it to their destination and are currently staying at the Mackinaw Mill Creek Camping Park. Mr. Allen was sick over the weekend but is now feeling much better. We are going to sign off for now. Please check back next week to see if the Allen's choose to embark on the same adventure on the way home. Have a wonderful 4th of July! The Allen's have decided to undertake the same adventure on the way home. On Saturday, they visited Sault St. Marie and are now in Marquette, Michigan. They lost each other earlier this morning but have since been reunited. Mr. Allen rode his Whizzer 184 miles yesterday and has ridden 54 miles so far today. It was storming and they lost each other one more time yesterday but were again reunited. They stayed the night in Wakefield, Michigan. It has been cold and foggy so far this morning. They are now in Ashland, Wisconsin and are hoping to make it into Duluth, Minnesota today. Mr. Allen rode his Whizzer 209 miles yesterday. The wind was in his favor. They are really moving the last couple of days! They have gone a total of 568 miles since they left Sault St. Marie on Sunday, July 7th. They took a detour yesterday and arrived in Grand Rapids, Minnesota last night. His support crew is sleeping in today. It is currently raining and cold. Something we didn't mention before...both Mr. and Mrs. Allen came down with the flu during the week of July 4th and they're both feeling very well again. Mrs. Allen gave Mr. Allen one of the best presents he's ever been given last week - she quit smoking. Way to go Mrs. Allen-we are all very proud of you! Mr. Allen rode his Whizzer 121 miles yesterday and 60 so far today. They hope to make it another 50 miles today. They are 749 miles into their trip home. They stayed in Fosston, Minnesota last evening. He says today is great "Whizzing" weather. Mr. Allen would like to extend an invitation to anyone interested to ride along with them. Please give us a call toll free at 1-877-944-9937 if you would like to join up with them along the way. They are currently almost to East Grand Forks, Minnesota and are traveling on Route 2. Mrs. Allen got ahead of Mr. Allen yesterday and enjoyed winning $150.00 at The Palace Casino nickel slot machine. The army worms that were migrating on their way to Michigan have now turned into moths and are swarming about everywhere. The Allen's would like to say hello to their family and friends. Mrs. Allen wants the ladies she makes dolls with to know that they are now on the down hill side of returning home and they should begin thinking about new dolls they want to create. Mr. Allen rode his Whizzer 140 miles yesterday and 31 so far today. They are now 860 miles into their return trip and over 3,400 miles total. They stayed the night in Lakota, North Dakota. The amount of mosquitoes is coming down quite a bit because they only had to fight off 37 in their trailer last night. They are currently in Devils Lake, North Dakota and spent some time this morning with Jamie Orness, a gentleman they met at the St. Ignace car show. Mr. Orness builds custom autos in his shop, Black Magic Rod & Custom. He gave the Allen's a tour of his facility where he has numerous collectibles including several '50-'51 Mercury's, a life size statue of Elvis and a statue of Al Capone. The Allen's visited friends of theirs Friday night in Minot, North Dakota. On Saturday, Mr. Allen rode his Whizzer to Williston, North Dakota. Yesterday, he rode 171 miles and has ridden 161 miles so far today. They are now in Havre, Montana. 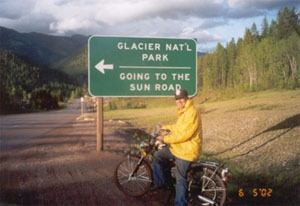 Mr. Allen has ridden his Whizzer 1,461 miles since they left Sault St. Marie, Michigan. Mrs. Allen has stayed right along with him (or ahead of him on many occasions) throughout the trip. It has been very hot the last couple of days...it reached 100 degrees yesterday. The Allen's would like to thank North Dakota Classics in Minot for donating a wiper motor for their car. Mr. Allen rode his Whizzer 204 miles yesterday and 28 so far today. They are now in Ft. Benton, Montana. 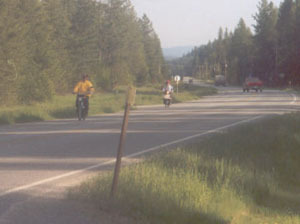 They are heading south on Highway 87 toward Great Falls to avoid the mountains. Since the wind is now against them, the mountains would be a tough journey. They are getting anxious to get home now and Mr. Allen said he's starting to get "saddle sore." 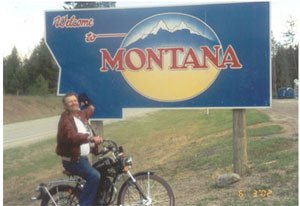 Mr. Allen has ridden his Whizzer 243 miles since our last report and they are now in Missoula, Montana. They decided to stay in a motel this evening which thrilled Mrs. Allen! They are hoping to be home in four to five days. 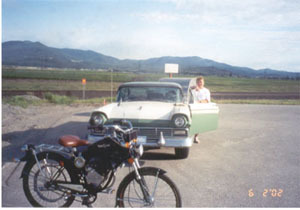 Mr. Allen has ridden his Whizzer 121 miles so far today and they hope to make it to the Montana/Idaho border before the day's end. They are currently cruising on Highway 200. Mr. Allen saw a 4.5 foot rattle snake in the middle of the road yesterday. Mrs. Allen said that staying in the motel last night was PURE HEAVEN! Mr. Allen broke his record yesterday by riding his Whizzer 261 miles. He said he has T.B. (tired behind) today. They have gone 68 miles so far today and are currently in Tokyo, Washington. Believe it or not, they're only about 150 miles from home but they're not sure if they're going to tough it out and make it home today or splurge in a nice hotel tonight and roll in early tomorrow morning. Your web reporter is leaving for vacation today and won't return until 7/31. Thanks for staying with the Allen's throughout their journey. I'm sure all of your warm thoughts and prayers have helped to make their trip a success! Congratulations to Mr. and Mrs. Allen for their successful completion of their 4,552 mile Whizzer adventure. We'd like to take this time to share some of the bike related aspects of the trip. Average speed was 25mph, crankcase oil used was Amsoil synthetic, the oil was changed every 200 miles. 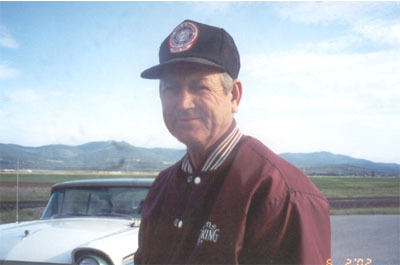 The original engine that was used to begin the trip was an engine that Mr. Allen had modified. This engine was replaced after 928 miles with a stock Whizzer engine. The stock engine was used for the remainder of the trip with the following maintenance requirements: replaced two leaking head gaskets, repaired loose intake valve seat and replaced clutch pulley. In addition, he replaced one mirror, one headlight lens holder and repaired the exhaust pipe rear mounting bracket. Mr. Allen said he had so much fun that he'd make the trip all over again (of course not without the support of his lovely wife.) He visited us on September 16th during his cross country adventure on his Harley. It was very nice to finally get to meet a person we've grown so close to through phone communications. Thank you Mr. and Mrs. Allen for allowing us to be a part of this GRAND ADVENTURE!